Make a leap into your future with Skoltech! One of the advantages of the Skoltech Life Sciences programs is a strong network of the Center of Life Sciences with Industrial and academic partners which allows our students to have Industry immersions and to perform research at different places throughout the world. To tell the truth, we all often tend to put important and laborious things on the back burner. But then, at the eleventh hour we suddenly realize that the deadline is due and nothing is ready. Besides this obvious reason, there are some convincing arguments to start preparing an application to Skoltech as soon as possible listed by Skoltech professor Mikhail Gelfand. It goes without saying, that professors are humans too and will prefer to interview two or three students per day than talking to a stream of applicants all day long. Naturally, they also feel more tired at the end of semester. And a tired professor, as you can guess, is more likely to be an angry one. Exams of all kinds, bachelor thesis defenses and other joys of students’ life take place at the end of spring the beginning of summer. If you are admitted to Skoltech by the beginning of spring you will have a chance to save your nerves and strength after graduation. Enter Skoltech, defend BSc thesis, pass the final exams and become free! Admission to Skoltech in spring guarantees you longer holidays and a well-deserved summer. If you failed to enter Skoltech in the first phase for some reason you could be put on a waiting list. And if a place becomes vacant – for instance, if a successfully selected applicant gives it up – you can still claim it. If you get negative result already in spring you would have a plenty of time to find another place and try to be admitted to another university. And finally, the spring time! The springtime is a lovetime with birds singing, swirling and winging in the blossoming, and you would have a chance to enjoy it (entirely) once the result of your admission is known at the very end of spring. That is why the romantic natures who love to listen to nightingale trills and enjoy the smell of swelling buds are strongly recommended to apply to Skoltech as soon as possible. The admission campaign is open! Apply now! 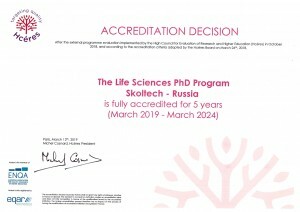 Skoltech Life Sciences MSc program is highly competitive and efficient based on the evaluations of its students’ theses by faculty from top international universities and number of program graduates who continue their education in top universities worldwide. Duration of the Life Sciences MSc program is two years. In course of the first year, students deepen their theoretical background, while in the second year they mainly work on their research projects. Skoltech gives all students the freedom to choose courses and extra-curriculum elements to shape an individual trajectory, acquire soft skills, gain entrepreneurial competencies and get prepared for job placement. All MS students are guaranteed a stipend of 40 000 Rub in addition to health coverage for the duration of their studies, provided that academic standards are met. Successful accomplishment of the program gives students Master of Science degree in Biotechnology. The program director is Professor Mikhail Gelfand. The program coordinator is Nina Popova. The Life Sciences PhD program is one of the most successful PhD programs at Skoltech. Its students publish numerous papers in top journals and get awards for presentations at international conferences. Duration of the Life Sciences PhD program is four years. Skoltech gives all students the freedom to choose courses and extra-curriculum elements to shape an individual trajectory, acquire soft skills, gain entrepreneurial competencies and get prepared for job placement. 6 ECTS credits for thesis defense. All PhD students are guaranteed a stipend of 75 000 Rub in addition to health coverage for the duration of their graduate studies, provided that academic standards are met and progress towards a PhD is maintained. All PhD applicants are highly recommended to contact a proposed future advisor and discuss a research project before applying to the program. The program director is Professor Konstantin Severinov.